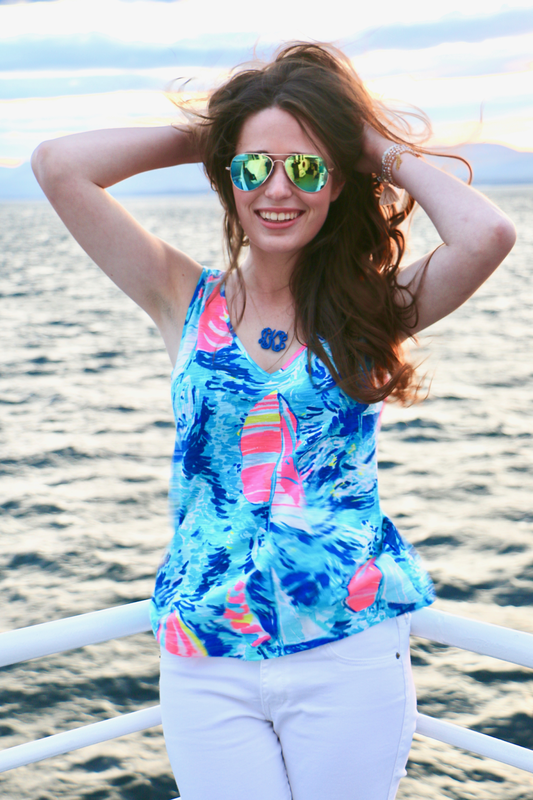 Nautical Lilly Pulitzer Look + More After Party Sale Favorites. Happy Day Two of the After Party Sale! I'm so excited to share this fun nautical Lilly look today, and to talk a little bit about what occasion in Vermont I got to wear this look for. First- let's chat about this look! 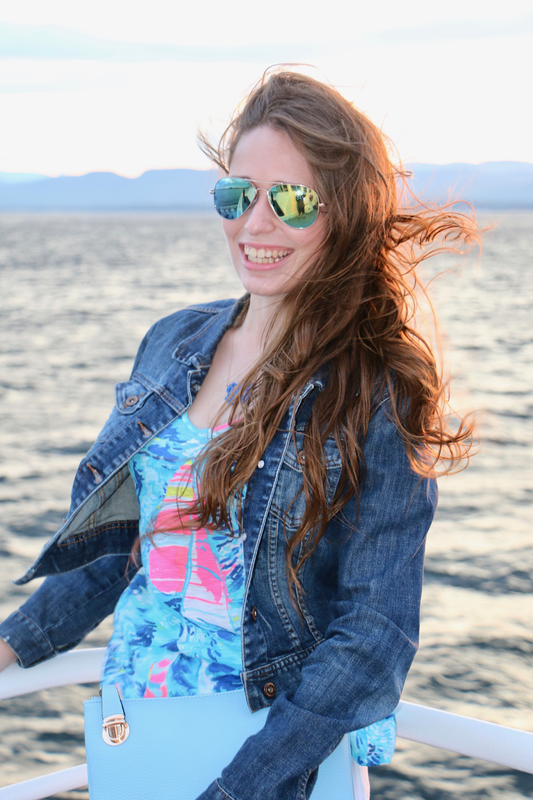 I talked about when I purchased this tank during a recent weekend trip home to Maine in this blog post. I'm so glad I did! It's the perfect little summer top. I might even try and transition it for some early fall outfits by pairing it with a navy skirt and jean jacket! I knew though when I purchased it that the ideal summer look for it would be with white jeans- and it didn't disappoint! I think the perfect finishing touch to this look was my new adorable clutch from my favorite jewelry and accessories store back in Maine, The Best of Everything! 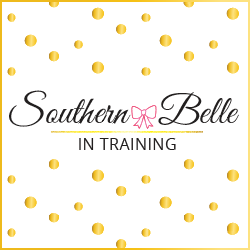 The sweet team there recently sent me a box of goodies, and I loved everything! 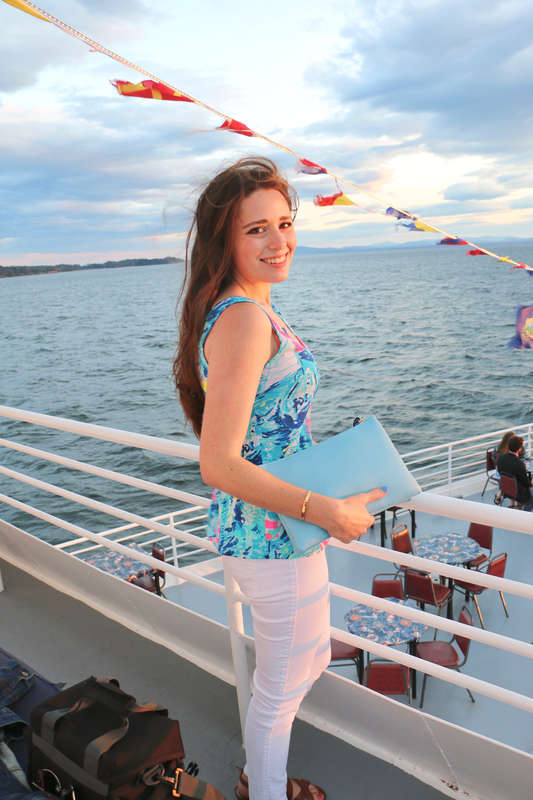 I wore this outfit when my dad and I went on a sunset lake cruise during his visit to Vermont last week. It's something I've been wanting to do since I moved here, and the night that we ended up booking it was perfect! I had a really long and stressful day at work earlier in the day, and it was so nice to board the boat, watch the sunset, and just relax! The cruise company is called Spirit of Ethan Allen and they leave right from Burlington. I did get slightly seasick after the sun started to set and it was harder to see outside, but while we were outside earlier during the cruise I was fine! I love how these pictures turned out- although it really doesn't do the views justice! Happy After Party Sale shopping!!! I'm loving your picks! I waited 3 hours in a virtual-line yesterday LOL but I'm so glad I did because I found some seriously awesome stuff!! So exciting! I went really light on the sale this year (budgeting you know??) but it was fun none-the-less! This is definitely the best time to buy Lilly! How perfect was your new tank for your cruise?! Loving that top on you lady! These seems like so much fun! You look amazing in this outfit! This is such a cute top! Def going to have to check out the sale! I'm not a big fan of lily pulitzer because her pieces are too bright, but I love how you downplayed such a bright shirt! 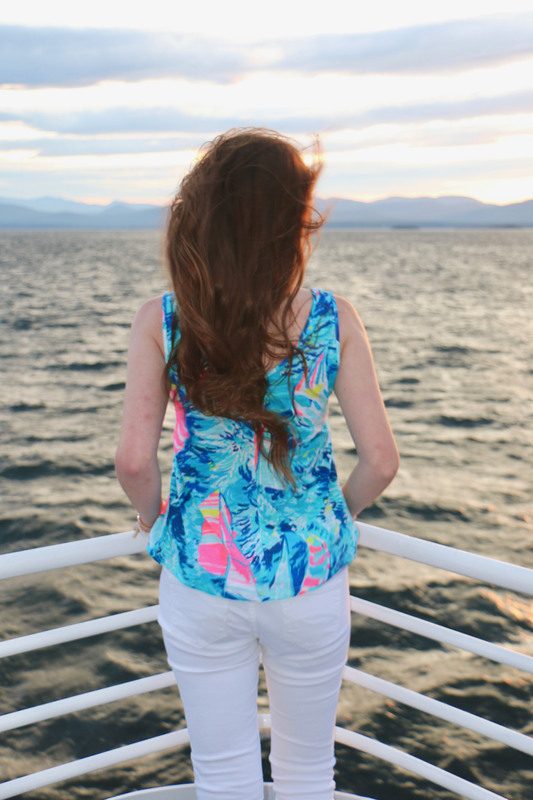 That top is SO perfect for a sunset cruise and the photos are lovely. There are so many gorgeous pieces at the After Party Sale this year! Aww girl you look so cute!!! Looks like you had ad a great time. Such a cute tank! 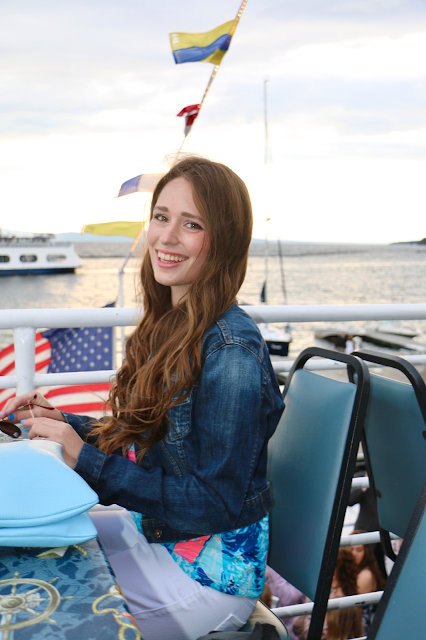 Perfect look for a sunset cruise! Love that you can wear it as a summer piece and as an early fall piece. 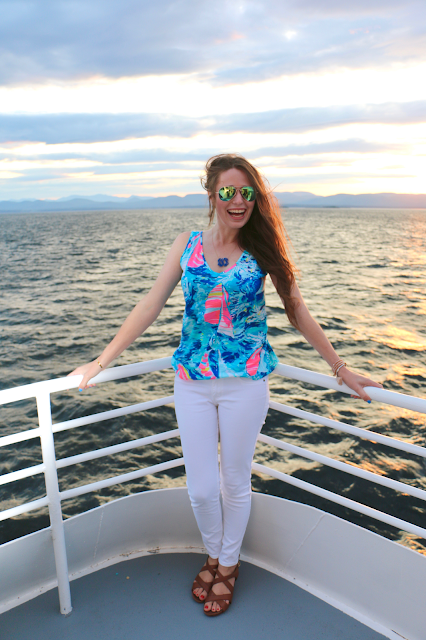 That top is so beautiful and so insanely perfect for a cruise!! You look gorgeous. Love this jean jacket to complete the look. Perfect for summer!